Funds raised to help put an end to youth homelessness in Greater Victoria area. The community spirit is strong in the various neighbourhoods that span Oak Bay, Fairfield and the Jubilee areas. Bringing your recyclables to the various depots is a great way to meet neighbours, keep the environment clean and donate to charitable causes. The Threshold Recycling Days fall on the 4th Saturdays of every month (except December). The recycling depot is set up in the parking lot of 600 Richmond Ave, off of Richardson St at St Matthias Church. Hours of Operation: 9am – 11am. Some of the monies collected will go to the Threshold Housing Society to assist in their mission to provide life-skills for at-risk youth in their housing programs. A Bottle Drive is also available on site for anyone to donate their refundable containers. The proceeds all go to support the same life-skills program at Threshold Housing Society. To learn more or to become a volunteer for the event, speak with a volunteer on site (look for the orange shirts!) You can also sign up online here. HeroWork is currently working hard to renovate the offices of Greater Victoria Citizens’ Counselling Centre on King’s Road. The Centre assists adult community members in attaining socially and psychologically satisfying lives by providing quality, accessible, volunteer counselling service. Most importantly, they offer affordable rates for people of any wage bracket. With such a lack of accessible mental health resources in the community, the work of the Centre is vital. Paul Latour and his HeroWork crew is heading the renovations. They work on the principal of gathering ordinary community members to participate in an extraordinary experience of old fashion “barn-raising.” The experience of volunteers has been very positive and in some cases transformative. It is not too late to volunteer for the next two weekends. Go to HeroWork and sign-up and learn how “community” really feels. It will change the way you feel about Victoria! Read the recent article in the Times Colonist. Adoption placement for kids in care came up short in 2014, despite $2 million earmarked funding. The independent representative for children and youth, Mary Ellen Turpel-Lafond advocates to give the reprsentative’s office funding to work on adoption placements. TORONTO, ON (May 28, 2015) – As part of its commitment to help end youth homelessness in Canada, The Home Depot® Canada Foundation launched its annual The Orange Door Project fundraising campaign today, which collects $2 donations from customers and gives 100 per cent of the proceeds to local youth-serving organizations. Customers shopping in the Victoria Saanich and Victoria Langford Home Depot store[s] can donate $2 at the checkout in exchange for a (paper) Orange Door. One hundred per cent of proceeds stay in the community and go to support the housing and life-skills development programs at Threshold Housing Society. The campaign runs until July 2, 2015. Threshold Housing Society provides transitional housing to youth who have been abandoned, are escaping violence or are leaving foster care. They operate two programs: one that employs a semi-independent model and the other is a supported independent model. Both housing programs are augmented by a life-skills program called “self-worthshops.” This program aims to build self-esteem by lessening the effects of trauma through intense youth engagement with emphasis on inclusion and connection. Once stabilized, youth receive the resources they require to complete their education, job training or seek employment until they are ready to transition to full independence. Youth who successfully leave the streets within two years or less are more likely to make a healthy transition to adulthood – making an intervention early is key to solving the problem. Threshold Executive Director, Mark Muldoon, receiving a $10,000 grant from TELUS via Mel Cooper, Chair of the TELUS Victoria Community Board. On Saturday, May 9th, 2015, , Mr. Mel Cooper, visited Threshold Housing Society, and presented Threshold with a fantastic grant to support youth transitional housing in Greater Victoria. In the March 2015 study on youth housing released by the Greater Victoria Coalition to End Homelessness, the current state of housing for at-risk youth was stated to be in “a crisis” with youth 19 and older being in “dire” need. Threshold staff surrounded Mel as he told the stories of inspiring organizations that the TELUS Victoria Community Board has helped and why they help. The staff were grateful for the grants we received from TELUS, and filled with joy and acknowledgement that Threshold were choosen to receive a community grant. A local chorus of approximately 50 women, Kintara Women’s Chorus, conducted by Signi Murgatroyd, MMus., BMus., A.R.C.T. (Voice), is donating the proceeds of its upcoming concert to Threshold Housing Society. “The Rhythm of Life” Concert by Kintara Women’s Chorus will be held at St Aidan’s Church (3703 St Aidan’s Street) this Saturday, May 9th, starting at 7:30pm (door opens at 7pm). Admission by cash donation. Threshold appreciates the kind donation from Kintara Women’s Chorus, and encourages music-lovers and friends of Threshold and Kintara to join us for an evening of beautiful chorus music. 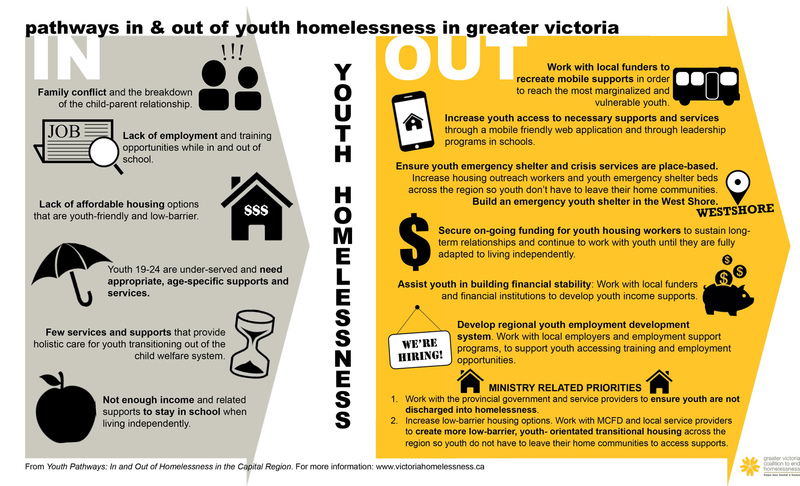 Further to the study released by the Greater Victoria Coalition to End Homelessness (GVCEH) in March 2015, entitled, Youth Pathways In and Out of Homelessness in the Capital Region, the GVCEH produced an infographic that details the various reasons why some youth fall into the risk of becoming homeless and the ways the community can help to avoid and prevent this negative path from happening. The Greater Victoria Coalition to End Homelessness (GVCEH) published a report indicating there are gaps in help for Greater Victoria’s Homeless Youth. Every youth in our program has their own journey toward a stable, contributing life in the community. Our housing programs give them the stability they can build on to further themselves. Though we support and gently nudge as they are all unique and deserving, the path the youth choose to walk are up to themselves. One of such youth in our program, KW, has chosen to walk barefeet on his daily 2-hour commute to a community college to study Hospice Care. This is part of his journey to appreciation and service to others.